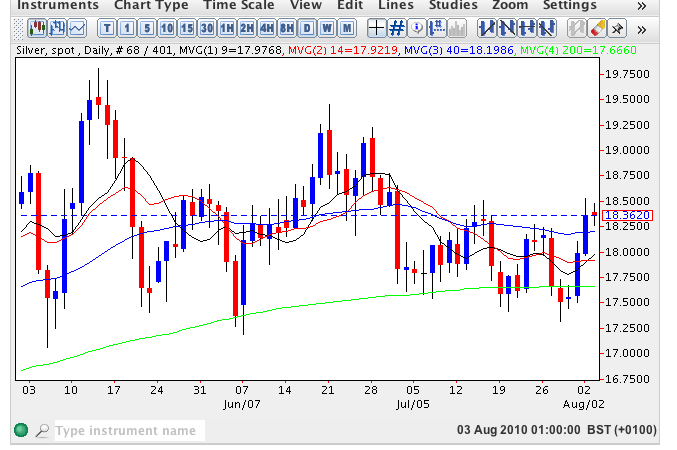 Spot silver continued Friday’s positive sentiment with a second widespread up candle which broke above the 40 day moving average closing at $18.38 per ounce and holding above all four moving averages once again. Whilst this is a positive signal yesterday’s high touched $18.52 per ounce, a level at which we saw a pullback in early July so for longer term trend trading we need to see this level breached as it defines a weak area as evidenced both in April and May of this year. Once spot silver prices have cleared this price point then expect to see the commodity push on to re-test $19.13 per ounce in due course and should this be cleared then the deep consolidation of the last few months should provide us with a solid platform for a strong move higher and break above $20 per ounce in the medium term. Longer term the outlook for silver remains firmly bullish and by the end of the year we can expect to see silver testing the $21.34 high of 2008 as a result.